I spent an absorbing 5 days in Macau over the holiday, not only because of the International Baccalaureate education conference I attended, but also because of the city-state itself. Let me explain the title of the blog post. 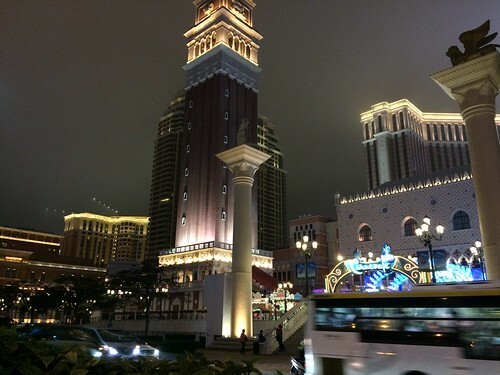 The main part of Macau is a peninsula jutting out into the South China Sea. It is separated from mainland China by a river. I stayed on a hill that was a park amidst a sea of apartment buildings and traffic.I think the hotel was a former convent because its name, Posado de las Monjas (Lodging of the Nuns), which is today a hospitality and tourism university. The university runs a small hotel and nice restaurant, and I highly recommend both. I thought it funny that the Chinese taxi drivers only recognized it as Mung-ho and not the original Portuguese of monjas. Macau is the most densely populated country in the world and I really felt it, despite being in the middle of a park. As you can see from the view from the top of the hill, there is a lot of humanity packed into a small space. The peninsula is where most citizens live and it was generally run down, chaotic but people were friendly and no one bothered me. The historic center is quite nice, with typical Iberian main plaza, a cobblestone shopping street and beautiful facade of an old cathedral. The rest of the peninsula was old dingy apartment buildings and colonial buildings that have seen better days. Macau also has two islands, now one island because of land reclamation. This is the casino tourism part of the city-state and totally different from the old city in the peninsula. I have not been to Las Vegas in 20 years but the size of the casinos and connected shopping malls, restaurants and night clubs reminded me of my time there. The size of the casinos are immense and it is hard to capture the scale. The conference was held at the Sheraton, the world’s biggest, and walking between the meeting and exhibition rooms took a long time. 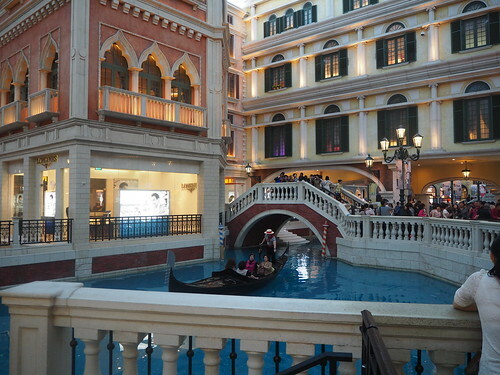 I went for a walk across the street via covered walkway and went into the Venetian casino’s shopping mall, which was a replica of Italy, with canals, gondolas and even St. Mark’s Square. There was also an events arena attached to the mall. I sensed that the Chinese with their new found wealth really wanted to spend it. 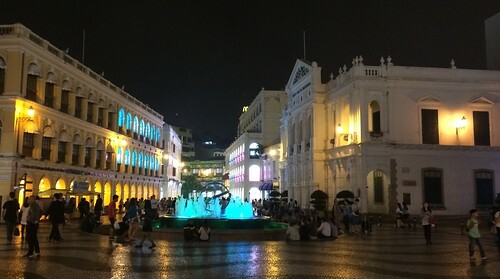 This part of Macau was a capitalism/consumerism amusement park. It had all of the brand name stores, Dolce & Gabbana, Rolex, etc. I didn’t see much of the reported slowdown of tourists, in fact, there were 4 massive construction projects. Thousands of workers and tens of huge cranes could be seen as I walked around the island between meetings. I don’t see the appeal of a casino vacation, and the idea of a family resort destination had not reached Macau yet. The vibe of the place is captured in this David Beckham ad for the Venetian casino. He does an incredible acting performance by the way! This is one place I could never live. The opportunity for outdoor pursuits, like biking or jogging were extremely limited. There were some pathways along the water front and in the parks, but only short distances. I also was intrigued by the pollution. Although my app said the air quality of the city was fine, I never did see the sun or blue sky. It was a constant haze as seen from the window of the taxi I took across one of the three bridges to the casino island. It will be interesting to see how Macau develops as the Chinese economy matures and takes over the city-state in 2049. 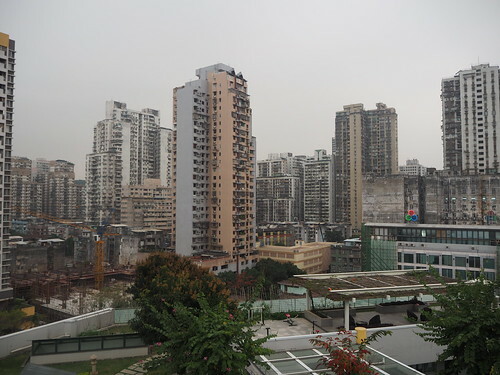 I am also curious now to visit Hong Kong, and compare and contrast it to Macau. 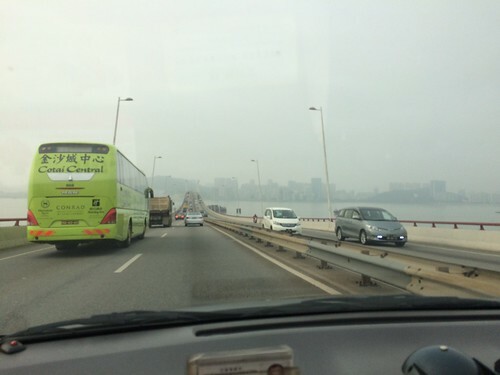 I talked to a taxi driver from Macau and he didn’t care about being taken over by China. He didn’t like the government trying to control the number of mainland tourists who were coming to the city, but he argued that the city was already Chinese and he was just concerned about making a living and providing for his two children. It would take an extremely generous salary and benefit package for me to work in China. I’ll wait to visit Shanghai and Beijing before making a firm judgment, but I was relieved leave Macau and come back to the quiet and refined system of Japan. Yes Bill the gray haze is awful. I think we saw blue skies less than 20 times in our 2 years there. That’s right – you lived in Macau. I can see why you didn’t stay a long time, but a very interesting place. Thanks for reading my blog.